to drive collections and save time. 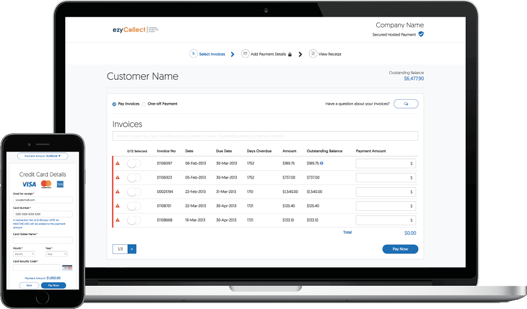 Automate, schedule, personalise & customise all your collection activities in minutes with ezyCollect's Accounts Receivable Automation Software. If your business is spending too much time and resources chasing customers for payment, following up on promised payments then it may be time to think about changing the way you collect. That’s where ezyCollect steps in, a secure cloud-based app that seamlessly intergrates with your MYOB ERP software and then streamlines and automates manual collection tasks such as sending emails, SMS’s and postal letters so you can put your accounts receivable on autopilot and accelerate cash recovery. You can also schedule phone calls for staff, manage disputes, track conversations and payment promises in the customer dashboard, escalating cases as needed. Sometimes, despite your best efforts, you may need a recoveries expert to step in and help you get paid. ezyCollect makes this easy with one click escalation. Easily outsource to your preferred provider or integrate with ours. Easily exchange the history of the debt and let them get to work. All your receivables mapped for you. Get visuals on the success of your accounts receivable process. Clear visibility for your entire team on trouble areas that need your focus. Instantly see where the cash is hiding. We believe that the greatest resources in business are dreams and ambition. We believe that ambitious businesses deserve to be paid on time. We believe that being paid on time helps businesses to survive then thrive. We believe that when businesses flourish, people flourish. We believe in keeping the dream alive. Ezycollect’s purpose is to put smart technology in the hands of ambitious business so they have the cash and confidence to manifest their dreams.